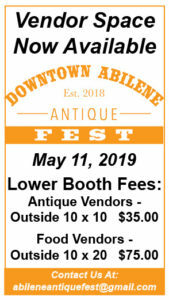 We’re closing the streets in downtown Abilene for the 2nd annual antique festival. If you’re a vendor of antiques or repurposed goods or a food truck, we’d love to have you join us for a fun day! Please submit your application by April 1.